Do TOP Woes Fuel Titans Bad Run Defense? Much has been made about the putrid Titans run defense and indeed it has been terrible. My position has always been that the defense overall would be better if the Titans offense didn’t regularly struggle and that ball control remained an issue. I also felt the Titans gave up their most yardage particularly in the 4th quarter when time of possession had been an issue. So, I decided to look at the numbers to see if the evidence to supported the theory. Here are the results that I found. 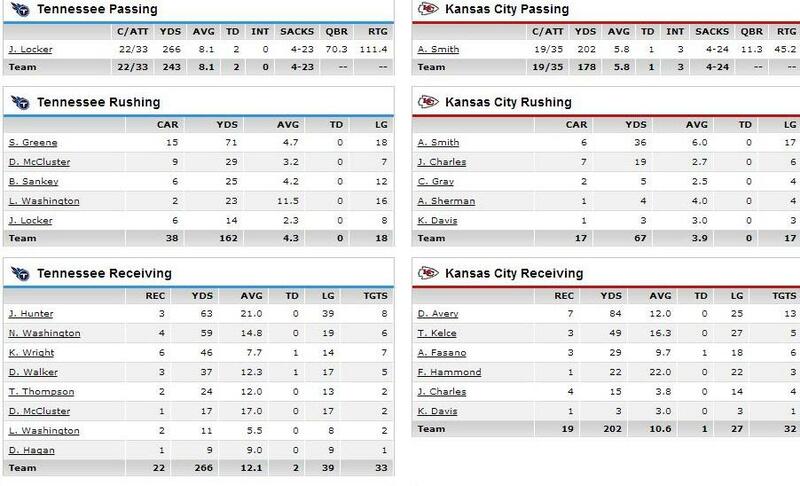 In Kansas City the Titans played good football and won. They were able to limit a Kansas City Chiefs offense without DWayne Bowe or Deanthony Thomas. The Titans stymied the Chiefs offense and the defense was looking pretty swell at that point. The Dallas game is where this theory began to take hold. Time of possession was overwhelming weighted in favor of the Cowboys. The Titans offense was unable to stay on the field. The Titans defense gave up 220 rushing yards with DeMarco Murray accounting for 167 of those. The Cowboys carried the ball 17 times for 61 yards in the 4th quarter. Cincinnati is an interesting game. The Titans lost that game and were blown out but the time of possession was fairly even. 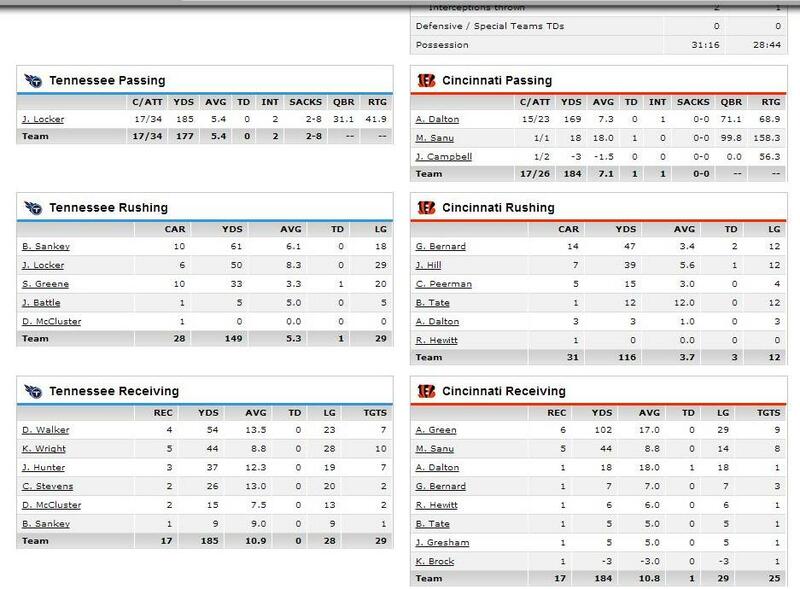 Also, while Cincinnati ran the ball the numbers don’t look that bad until you look at the 3rd and 4th quarters. In the first quarter, the Titans held the ball 8:22 to the Bengals 6:38. They carried the ball six times for 28 yards which is nice but nothing special. In the 2nd quarter the Titans held the 10:03 to the Bengals 4:57. However, Locker threw two interceptions in the red zone which were game crushing plays. While the Bengals threw an interception of their own the Titans never did seem to recover from those mishaps. The Titans run defense had held strong in that quarter allowing Cincinnati five yards on four carries. In the 3rd quarter, Cincinnati held the ball 8:23 to the Titans 6:37. They rushed for 42 yards on 11 carries and a touchdown. In the 4th quarter, Cincinnati carried the ball 10 times for 41 yards and a touchdown. The Titans held the ball 6:14 while the Bengals held it 8:46. Indianapolis I think we can discount because of Andrew Luck who loves to sling the ball in the 4th quarter. Time of possession was once again horrible and Luck had his way with the Titans defense in the 4th quarter. 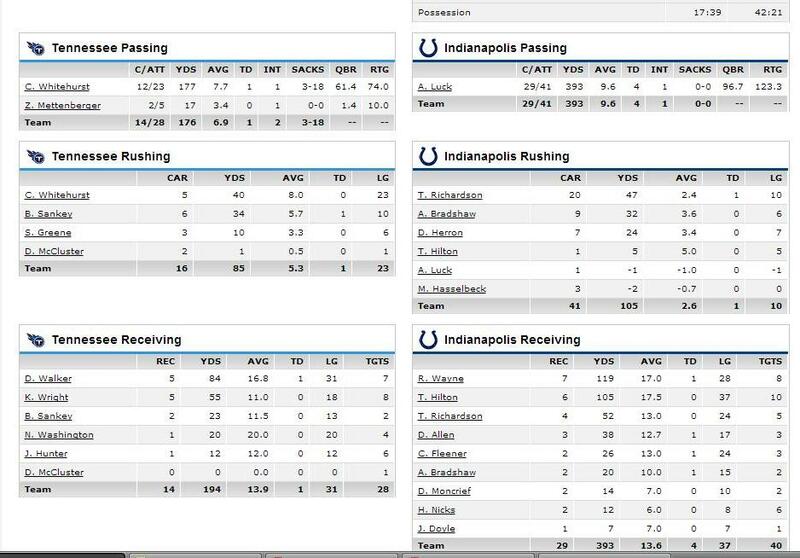 The Colts run game was rather pedestrian but it didn’t have to be special because Luck defines special. The Colts ran the ball 15 times for 30 yards in the 4th. Luck threw for 76 yards and a touchdown. The Colts held the ball 13:11 while the Titans held the ball 1:49. Against Cleveland the Titans held the lead because they were playing from behind and largely ran the ball well all game. The Titans dominated the first half of the game and went into halftime leading 28-10. They held the ball 16:62 to the Browns 12:58. They equally dominated the 3rd quarter holding the ball but the time of possession was evening up. They held the ball only 7:19 to the Browns 7:41. The Browns ran the ball 10 times for 47 yards. Hoyer threw the ball for 91 yards. The Titans lost slot corner Coty Sensabaugh to injury. They converted a field goal and the Titans went into the 4th leading by 28-13. In the 4th quarter, two rather significant things happened. First, the Titans had an awful special teams blunder when Brett Kern’s punt was blocked out of the end zone for a safety. Cleveland would go on to score on the ensuing drive due in large part to the indefensible ejection of Titans linebacker Derrick Morgan. In the 4th quarter the Browns ran the ball 10 times for 37 yards. Hoyer threw for 103 yards, two touchdowns and an interception. The Browns held the ball 8:38 to the Titans 6:22. The Titans would lose 29-28. You could easily discount Jacksonville and Washington because they were close games and none of these teams are good. However, we will look at the data anyway. This game pretty easily falls on less than optimal play calling. The Titans seemed determined to air the ball out though they did score on a one yard Jackie Battle run in the 2nd quarter. The Jaguars offense was overwhelmingly better than the Titans and if not for some poor play calling on the part of the Jaguars the Titans might have lost this game. The Titans offense completely stalled in the 4th quarter under Charlie Whitehurt and didn’t manage to convert one first down. The Jaguars held the ball 9:37 to the Titans 5:23. The Jaguars were driving at the end of the game and were two bad play calls away from going up on the Titans. Instead, the Titans defense held and they won 16-14. Washington is another example of bad team meeting bad team. 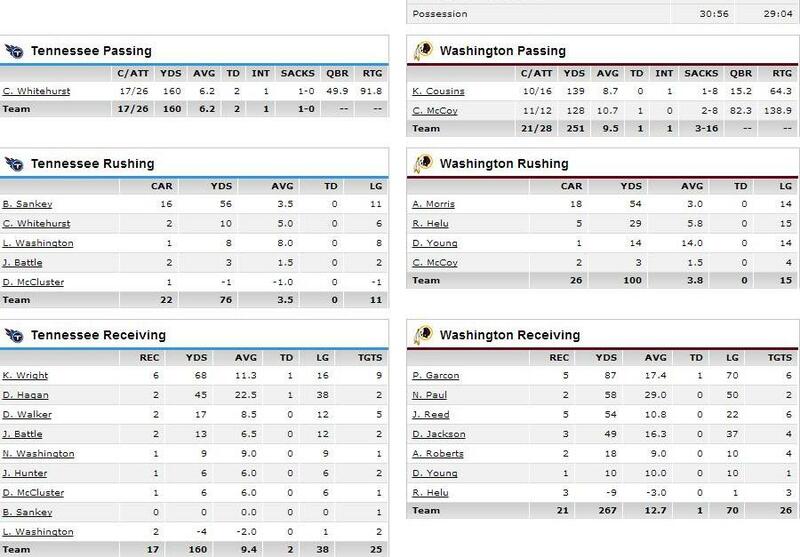 Kirk Cousins’ performance was so terrible he was replaced by Colt McCoy in the early portion of the 3rd quarter. McCoy would throw a touchdown pass to Pierre Garcon on his second play under scrimmage. Despite Cousins’ poor play, he started out rather well. Washington held the ball 8:40 to Tennessee’s 6: 20 in the first quarter. Washington ran the ball nine times for 35 yards. Cousins threw for 60 yards. The wheels started falling off in the second. The Titans held the ball 8:26 to Washington’s 6:34. Cousins threw for 79 yards but threw an interception. They rushed three times for three yards. The 3rd quarter time of possession weighs largely Titans but you cannot discount that McCoy threw a long touchdown pass only two plays into replacing Cousins. The Titans went into the 4th quarter down 13-10. Washington converted a field goal on their first drive and the Titans responded with a Charlie Whitehurst touchdown pass to Derek Hagan. The two teams then traded punts and Washington got the ball back with 3:16 left down 17-16. The ensuing drive featured two big defensive penalties. First, Jason McCourty was called for defensive pass interference giving Washington a first down at the 7 yard line. (There was an offsetting penalty on Shaun Phillips earlier). Washington already had field goal position already and then Mike Griffin was offsides giving them a 1st and 3 at the 3. They converted the field goal to win 19-17. Washington ran the ball fairly well in the 3rd and 4th quarters but it was mostly offensive ineptitude and defensive penalties that cost the game. Houston was another blowout and the 4th quarter run numbers are skewed because they were comfortably ahead and had sat Arian Foster who ran the ball over them to the tune of 20 carries for 151 yards. The Titans held the ball 5:16 in the 1st quarter to the Texans 9:44. Houston carried the ball 10 times for 40 yards. The Titans headed into the 2nd leading 3-0. Time of possession was fairly even in the 2nd with the Texans at 7:43 and the Titans at 7:17. Arian Foster began to chip away at the Titans. He rushed for 62 yards on seven attempts and a touchdown. The Titans didn’t try to run the ball very much and when they did they were unsuccessful. They relied on rookie Zach Mettenberger’s arm in his first start. Time of possession was once again even in the third quarter with the Texans holding the ball 7:33 to the Titans 7:27. Foster absolutely destroyed them in the 3rd rushing for 66 yards and a touchdown while adding one more through air. The Titans managed to score a touchdown on a 6 yard pass to tight end Delanie Walker but the two point conversion, an ill advised rush up with middle with Leon Washington, was unsuccessful. They went into the 4th quarter losing 27-9. With a comfortable cushion, the Texans held the ball 10:22 to the Titans 4:38. Here is the drive chart from that quarter. 3rd and 11 at TEN 34 (14:53) (Shotgun) R.Fitzpatrick pass short right to A.Johnson to TEN 31 for 3 yards (J.Casey). 1st and 10 at TEN 39 (14:04) (Shotgun) Z.Mettenberger pass incomplete short left to J.Hunter (K.Jackson). 2nd and 10 at TEN 39 (14:00) (No Huddle, Shotgun) Z.Mettenberger pass deep right to N.Washington to HST 18 for 43 yards (J.Joseph). TEN-N.Washington was injured during the play. His return is Probable. 1st and 10 at HOU 18 (13:28) (Shotgun) Z.Mettenberger sacked at HST 22 for -4 yards (J.Watt). 2nd and 14 at HOU 22 (12:58) (No Huddle, Shotgun) Z.Mettenberger pass incomplete short right to D.Walker (J.Watt). 3rd and 14 at HOU 22 (12:53) (Shotgun) Z.Mettenberger pass incomplete short right to D.Hagan. 4th and 14 at HOU 22 (12:46) (Shotgun) Z.Mettenberger pass short middle to L.Washington to HST 10 for 12 yards (M.Mohamed). 2nd and 6 at HOU 14 (12:02) A.Blue left end pushed ob at HST 16 for 2 yards (M.Martin). 3rd and 4 at HOU 16 (11:27) (Shotgun) R.Fitzpatrick pass short right to A.Johnson to HST 26 for 10 yards (A.Williamson). 1st and 10 at HOU 26 (10:43) A.Blue right tackle to HST 27 for 1 yard (J.Casey). 2nd and 9 at HOU 27 (9:58) A.Blue right end to HST 30 for 3 yards (A.Woods). 3rd and 6 at HOU 30 (9:16) (Shotgun) R.Fitzpatrick pass short middle to A.Foster to HST 43 for 13 yards (J.McCourty) [M.Martin]. 1st and 10 at HOU 43 (8:30) A.Blue right tackle to HST 42 for -1 yards (W.Woodyard). 2nd and 11 at HOU 42 (7:51) J.Grimes left guard to HST 44 for 2 yards (S.Hill; G.Wilson). 3rd and 9 at HOU 44 (7:07) (Shotgun) R.Fitzpatrick sacked at HST 44 for 0 yards (R.Pitoitua). 4th and 9 at HOU 44 (6:27) (Punt formation) S.Lechler punts 46 yards to TEN 10, Center-J.Weeks, fair catch by D.McCluster. 2nd and 10 at TEN 10 (6:12) (No Huddle, Shotgun) Z.Mettenberger pass incomplete deep left to J.Hunter. 3rd and 10 at TEN 10 (6:07) (No Huddle, Shotgun) Z.Mettenberger pass short right to B.Sankey to TEN 15 for 5 yards (A.Hal). 4th and 5 at TEN 15 (5:27) (Punt formation) B.Kern punts 59 yards to HST 26, Center-B.Brinkley. K.Martin pushed ob at HST 36 for 10 yards (J.Anderson). 2nd and 5 at HOU 41 (4:33) A.Blue up the middle to HST 43 for 2 yards (W.Woodyard). 3rd and 3 at HOU 43 (3:52) PENALTY on HST-B.Jones, False Start, 5 yards, enforced at HST 43 – No Play. 3rd and 8 at HOU 38 (3:51) R.Fitzpatrick pass short right to A.Johnson pushed ob at HST 44 for 6 yards (J.McCourty). 4th and 2 at HOU 44 (3:09) (Punt formation) S.Lechler punts 47 yards to TEN 9, Center-J.Weeks. D.McCluster pushed ob at TEN 18 for 9 yards (M.Mohamed). 2nd and 1 at TEN 27 (2:35) (No Huddle, Shotgun) Z.Mettenberger pass short right to D.McCluster to TEN 38 for 11 yards (J.Clowney). 1st and 10 at TEN 38 (2:05) (No Huddle, Shotgun) Z.Mettenberger pass short middle to B.Sankey to TEN 50 for 12 yards (J.Tuggle; A.Hal). 1st and 10 at 50 (1:57) (Shotgun) Z.Mettenberger pass short right to D.McCluster to HST 27 for 23 yards (D.Swearinger) [J.Simon]. 1st and 10 at HOU 27 (1:27) (No Huddle, Shotgun) Z.Mettenberger pass short middle to D.Walker to HST 12 for 15 yards (J.Tuggle). 1st and 10 at HOU 49 (:53) R.Fitzpatrick kneels to HST 48 for -1 yards. 2nd and 11 at HOU 48 (:33) R.Fitzpatrick kneels to HST 47 for -1 yards. Time of possession doesn’t appear to be a key here and Foster was having a great year before the injury bug hit once again. Playcalling and a rookie quarterback making his first start were key factors in this loss. Mettenberger threw an interception and also lost a fumble. The Baltimore game started with rather shaky but had promise. Shaun Greene fumbled at the 1 yard line on the opening drive but the Titans scored on their second one. They went into the 2nd quarter up 7-0. The Titans held the ball 12:50 to 2:10. The two teams traded punts and then Justin Forsett handily got around right outside linebacker Kam Wimbley on a pitch to the left. The two teams punted the rest of the 2nd until the end of the half. The two teams went into the half tied at 7. Time of possession favored the Ravens 8:26 to 6:34. In the 3rd quarter, Forsett scored again this time on an 11 yard run against the left side of the Titans defense. 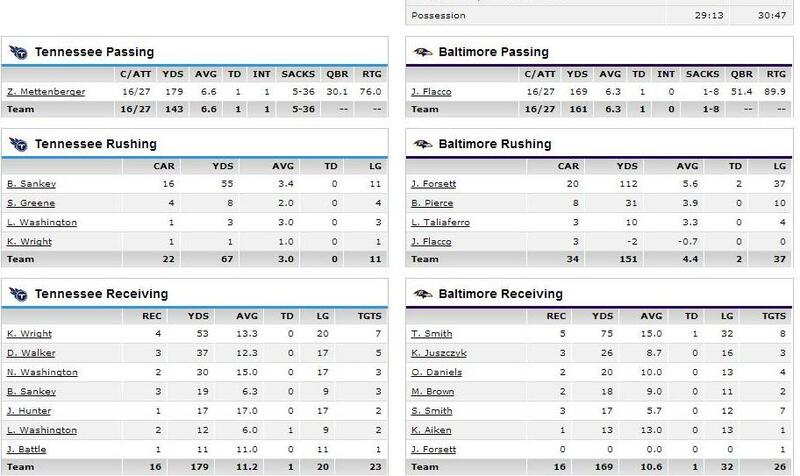 The Ravens held the 9:22 and rushed nine times for 45 yards and the touchdown. Flacco threw for another 51 yards. 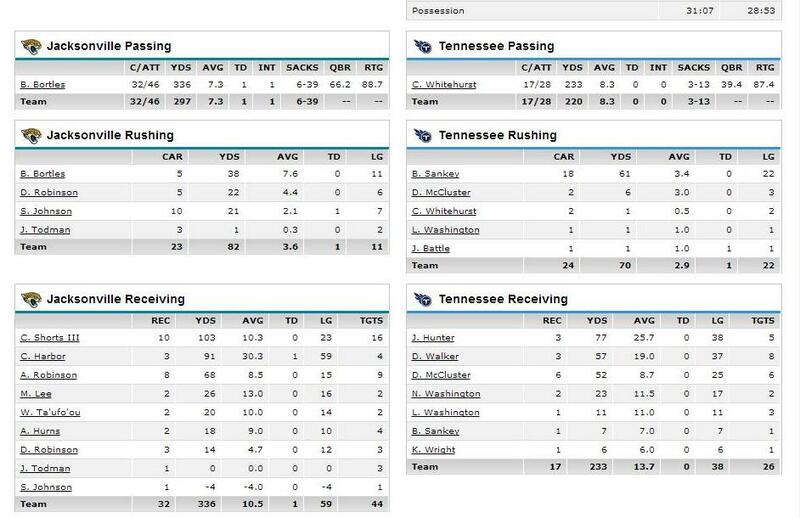 The Titans offense was completely ineffective only putting up 15 net yards and holding the ball 3:51. The trend continued into the 4th quarter. The Ravens held the ball 10:49 to the Titans 3:51. They rushed for 85 yards on 16 carries. Flacco only threw the ball twice but both were completions totaling 45 yards and included a 32 yard touchdown strike to Torrey Holt. 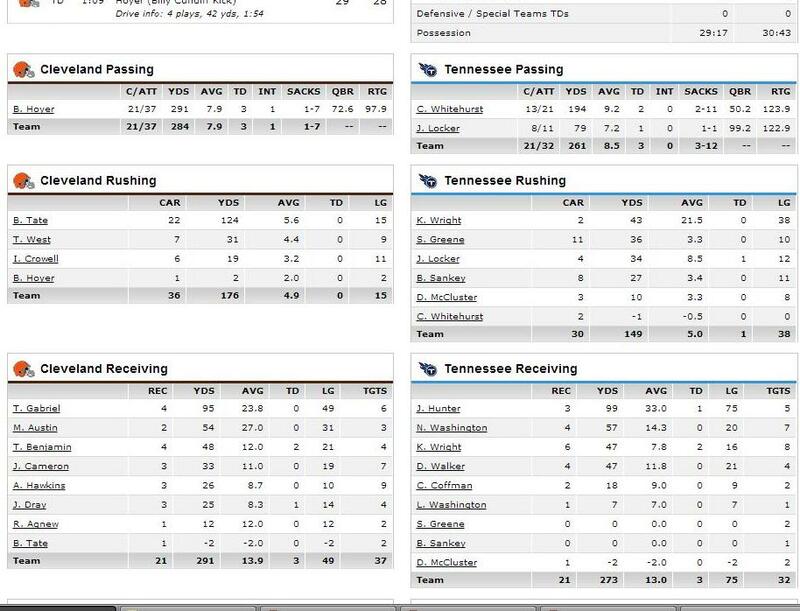 The Titans held the ball 4:11 and produced only 38 total net yards. Time of possession seems to play a role here. There were certainly blown plays that contributed but the defense was on the field 20:11 in the second half while the offense was on the field for 9:49. While the score was certainly closer in the Pittsburgh game time of possession does come into play. The Steelers held the ball roughly 40 minutes to the Titans 20. 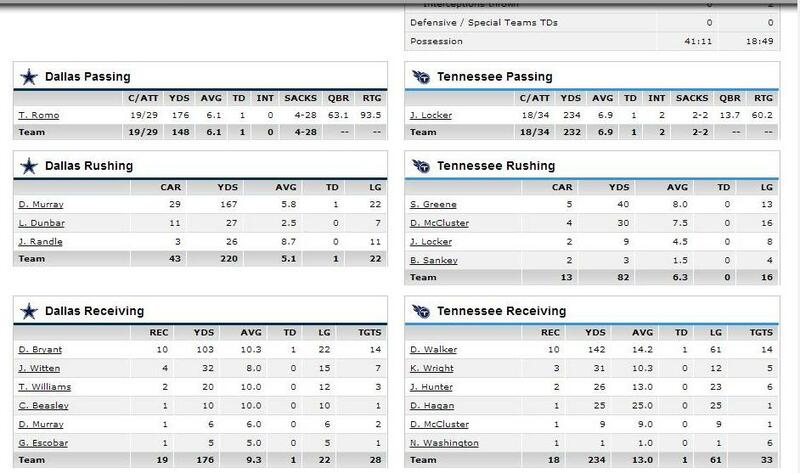 The Titans longest drive of the game lasted 5:16 and was an 11 play 77 yard drive culminating in a touchdown . Their shortest drive was 12 seconds. Both were touchdowns which is good but only the former gave the defense some semblance of a breather. 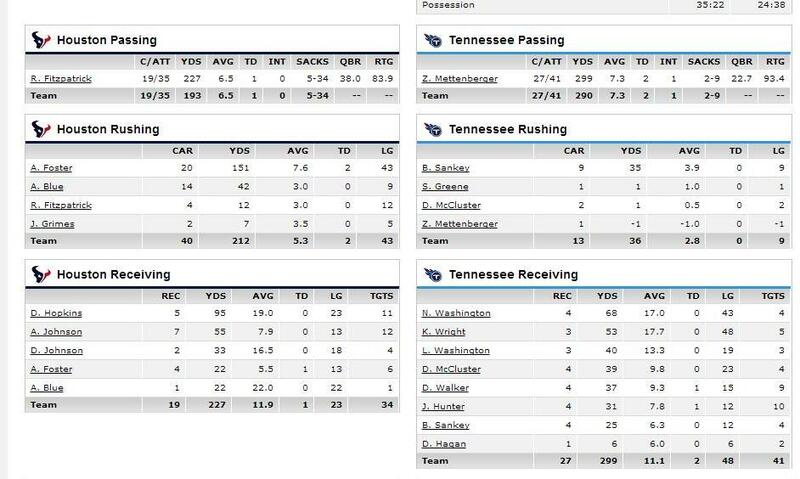 They also had three 3 and outs and Mettenberger threw a pick six on his first play under center. The drive chart is illustrative. In the 4th quarter, the Steelers held the ball 11:09 and Le’Veon Bell ran the ball 12 times for 74 yards and a touchdown. Ben Roethlisberger was efficient putting up 51 passing yards and finding Antonio Brown for another touchdown. The gassed Titans defense couldn’t do anything to stop them. Certainly the pick six hurt but the offense largely sputtered despite scoring the two touchdowns. The Titans were unable to establish any sort of ball control and were unable to stop the Steelers offense when it mattered. So there you have it. The Titans defense does have a tendency to give up big rushing yards, and plays in general, in the 4th quarter and time of possession is a factor. The Titans defense does struggle when it is on the field a lot and it is definitely not good enough to overcome the offensive deficiencies. It would be interesting to see how the defense would fare in a game where the offense was able to establish a rhythm and keep it going. The Titans might not ever be a ball control team under Ken Whisenhunt but they simply have to do a better job keeping their defense off the field.